Solange R. Salomão, Adriana Berezovsky, João M. Furtado, Arthur G. Fernandes, Sergio Muñoz, Nívea N. Cavascan, Marcela C. Cypel, Cristina C. Cunha, Galton C. Vasconcelos, Márcia R. K. H. Mitsuhiro, Paula Y. Sacai, Mauro Campos, Paulo H. A. Morales, Marcos J. Cohen, Jacob M. Cohen, Sung E. S. Watanabe & Rubens Belfort Jr. Older adults living in remote areas with limited access to health services are at higher risk to develop visual impairment and blindness. We conducted a population-based survey to determine the vision status in subjects 45 years of age and older from urban and rural areas of Parintins city, Brazilian Amazon Region. Participants underwent ophthalmic examination, including uncorrected (UCVA), presenting (PVA) and best-corrected visual acuity (BCVA). Vision status was described as lines of visual acuity (VA) impairment and lines of VA improvement from UCVA to BCVA and from PVA to BCVA in the better-seeing eye. A total of 2384 subjects were enumerated, 2041 (85.6%) were examined, with reliable VA measurements obtained from 2025 participants. Vision status in lines of VA impairment was (mean ± standard deviation): 3.44 ± 3.53 for UCVA, 2.85 ± 3.52 for PVA and 1.50 ± 3.51 for BCVA. Female gender, older age and lower education were associated with ≥6 lines of UCVA impairment. Lines of improvement ≥3 was found in 626 (30.9%) participants and associated with female gender and rural residency. In conclusion, a third of participants could have at least three lines of VA improvement with proper refraction. Strategies to improve access to eye care and affordable glasses are needed. The magnitude and burden of visual impairment (VI) and blindness usually are estimated through population-based epidemiological studies based on visual acuity cut-off criteria using either best-corrected or presenting distance visual acuity (VA)1. Most studies detail only the visual acuity levels of those blind or visually impaired, and little is known on the visual status of those considered with “normal” vision2. The distribution of visual acuity and impairment are of intrinsic value in defining the vision status of a population3. Over the last decade there was a shift between the use of “best corrected” to a current use of “presenting” distance visual acuity (visual acuity measurement using the refractive correction in use, if any) for blindness4,5, but most studies do not report uncorrected VA. A more detailed analysis across the entire visual acuity range from 20/20 to no light perception could lead to a better understanding of the vision status of specific populations, and advocate for medical interventions in those at risk of developing visual impairment in the future. The present data come from a recent population-based survey of visual impairment and blindness among adults in the city of Parintins located in the Brazilian Amazon Region (BARES)6. The city of Parintins with a 2010 census population of 102,718, is fairly representative in sociodemographic terms of the population of the Brazilian Amazon Region population. (The Brazilian Amazon Region has a total population of 24,700,000 with 72.2% living in urban areas.) Adults 45 years or older were 17.1% of the population in Parintins city (Census 2010) and 24% in the BARES sample with 44.7% of these male vs 44.9% throughout urban areas of the Brazilian Amazon Region. Literacy is 89.8% in Parintins, compared to 89.7% for the Brazilian Amazon Region. Our objective was to describe the vision status and improvement from uncorrected and presenting vision status to best-corrected vision status in urban and rural populations from the Brazilian Amazon. BARES is a population-based, cross-sectional epidemiological study designed to examine the prevalence and causes of vision impairment and blindness in a noninstitutionalized, population-based sample of older Brazilian Amazonians. Parintins is a 102,000 inhabitants city located at 02°37’42”S and 56°44′09″W, in the center of the Brazilian Amazon Region on the sides of the Amazon River, with hot and humid tropical climate. It can be reached by air (300 km) and about 420 km by boat from Manaus. The study population consisted of residents 45 years or older, living in 20 randomly selected clusters (14 urban and 6 rural) in Parintins city. The study population was selected through cluster sampling based on 2010 Census data5. In defining sampling frame clusters, census sectors with fewer than 70 persons 45 years of age or older were grouped with an adjacent sector and sectors with more than 140 persons 45 years of age or older were segmented, producing 154 clusters with 70 to 140 persons 45 years of age or older. Sample size requirements were calculated on the basis of estimating an expected blindness prevalence of 6% (50% higher than that used in an earlier study performed in Southeastern Brazil, the São Paulo Eye Study - SPES) within an error bound (precision) of 20% with 95% confidence interval7,12–15. Assuming an examination response rate of 85%, allowing for an arbitrary 50% increase in sample size to accommodate possible inefficiencies associated with the cluster sampling design, and adjusting for the finite population factor, a sample size of 1393, with an increase to 2459 persons 45 years or older was required. Accordingly, 20 clusters (14 urban and 6 rural), consisting of 18 census sectors, were randomly selected with equal probability from the 154 sampling units. Further details on sampling plan, and baseline demographic data have been reported elsewhere6. In brief, a door-to-door enumeration was performed and eligible subjects were informed about the study and invited to participate in a clinical ophthalmic examination. The institutional review board/ethics committees both from Universidade Federal de São Paulo (UNIFESP) and from Universidade Federal do Amazonas (UFAM) approved the study protocol. The study was carried out in accordance to the tenets of the Declaration of Helsinki. Written informed consent was obtained from all participants after explanation of the nature and possible consequences of the study. The enumeration form included household address, phone number, and a roster of those living in that home along with their gender, age and schooling. 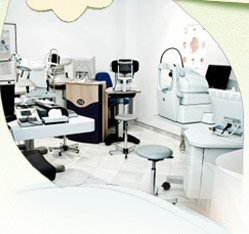 All eligible individuals (adults 45 years of age and older) were invited and scheduled for a detailed eye examination. Written informed consent was obtained at the examination site, followed by VA measurements for distance, refraction, and an eye examination. The examination protocol was similar to the one used in SPES7, including VA testing, which was performed in a standardized manner at the local eye clinic for urban participants and at an itinerant eye examination center for those living in rural clusters6. In-home eye exam was offered for those who could not come to the clinic and it was performed with portable equipment. Ophthalmic technologists measured from each eye presenting distance visual acuity (PVA), with spectacles if the participant presented with them followed by uncorrected distance visual acuity (UCVA), using retro-illuminated logarithm of the minimum angle of resolution tumbling E charts at 4 m distance. Details about visual acuity measurement procedure can be found elsewhere7. During the enumeration process participants were asked about spectacle usage and advised to bring their glasses to the eye exam. Glasses were cleaned before visual acuity measurement when needed. Best-corrected visual acuity (BCVA) was determined for each eye after auto-refraction followed by subjective refraction performed by an ophthalmologist. Vision Status – Lines of Vision Impairment and Improvement in Lines of Vision Impairment Vision status was defined for each eye by lines of vision impairment on the ETDRS chart from 0 to 16, with the number increasing as VA deteriorated. Accordingly, VAs of 20/20, 20/25, 20/32 and 20/40 were represented by line numbers 0, 1, 2 and 3, respectively. VA of 20/200 was represented by line number 10, with line 11 corresponding to VA of 20/250; line 12 corresponding to VA of 20/320; line 13 corresponding to VA of 20/400; line 14 to VA of 20/500; line 15 to VA of 20/640 and line 16 to VA ≤ 20/800. Improvement in lines of vision impairment was calculated for each eye as the UCVA line number minus the line number at BCVA; thus, a positive line change indicated an improvement of vision between UCVA and BCVA and a negative change indicated worsening of vision between UCVA and BCVA. Visual acuity measurements were categorized as: normal vision, ≥20/32; near-normal vision (mild visual impairment), 20/32 to ≥20/63; visual impairment, 20/63 to ≥20/200; moderate blindness, 20/200 to ≥20/400; and severe blindness, 20/400. Those with 20/20 vision in both eyes were noted. Multiple logistic regression was used to investigate the association of categories of age (45–54, 55–64; 65–74 and ≥75 years), gender, categories of schooling (none, less than primary, primary, secondary, high school or higher) and urban/rural residence with participation in the study and with vision impairment. Statistical analyses were performed using Stata/SE Statistical Software, Release 14.0, 2015 (Stata Corp, College Station, Texas, USA)8. Confidence intervals (CI) for prevalence estimates and regression odds ratios (OR) were calculated taking cluster sampling design effects into account. P values ≤ 0.05 were considered statistically significant.